Vineyard Vines Boy Outfits and Some News! If you ever take the time to watch my Instagram stories you know we have been spending a lot of time at the beach since purchasing a Summer cottage down in Madison, Connecticut in August. Today’s post is in collaboration with vineyard vines to share some of their back to school fashion and the shore was the perfect place to take these pics. Besides loving the vineyard vines clothing, the brand’s story really resonates with how I’ve been feeling. I also wanted to get to post out today because Vineyard Vines is also having their Friends and Family Event now through October 2nd where you save 25% off your purchase with code: FRIENDS2018 . If you’re not familiar with vineyard vines, they’re an incredibly well branded fashion line started by 2 brothers who grew up waiting all year to spend their Summers on Martha’s Vineyard. Their color palette and embroidered logo are easily recognized by many in New England and now around the world. Anyway, when we purchased a seasonal Summer cottage this year I felt a similar pull to the story of the 2 brothers who started vineyard vines. I never even considered the thought of living at the beach when I was a nurse practitioner with an office job. Now that my husband and I work from home I am having trouble shaking the idea. We are currently looking into finding a builder to potentially rebuild our Summer cottage (built in 1860) into a year round home. I can’t say what the future holds but it’s definitely on the table! vineyard vines has the most adorable back to school outfits and new arrivals for Mom and Dad as well!! These pictures of Mac and Cam melt me. When it comes to dressing my boys I prefer simple, classic looks. I will keep them in soft neutrals over character tees as long as possible. Somehow I even managed to get Mac into my favorite shade of pink because the plaid was subtle enough he didn’t realize. I picture American flags, weathered cedar shingles, and beachy embroidered detailing when I think of the vineyard vines brand and Martha’s Vineyard in general. You can see my husband’s belt has the American flags and the brand logo is an easily recognized whale. Cam’s hat (which a sea gull pooped on while we were taking photos – is that good luck?) is embroidered with a crab. vineyard vines has lot of options for women too! For the gal who likes a polished casual look (MEEEEE!!!!!) they have tons of cute wardrobe staples. Cozy pullovers, chambray and poplin button downs, classic pants, and more. I am very picky about my white jeans and I love this pair! Not too thin, not too tight – just right in my usual size!! If you don’t own a chambray shirt, I wear one year around (even as a swim coverup) and highly recommend this one as a closet staple you’ll hold onto for years to come. The shirt fits me gently relaxed in my usual size. The only thing holding me back from putting a for sale sign in my yard is how many friends and family I have just walking distance from our current home. I’d love to hear from any of you who may have been through this type of decision. We would be moving just under an hour from family if we rebuilt at the beach. Shop the white jeans I am wearing here. They fit true to size. Have any of you been to Martha’s Vineyard? If you have you probably know why they built a brand around it’s beauty. 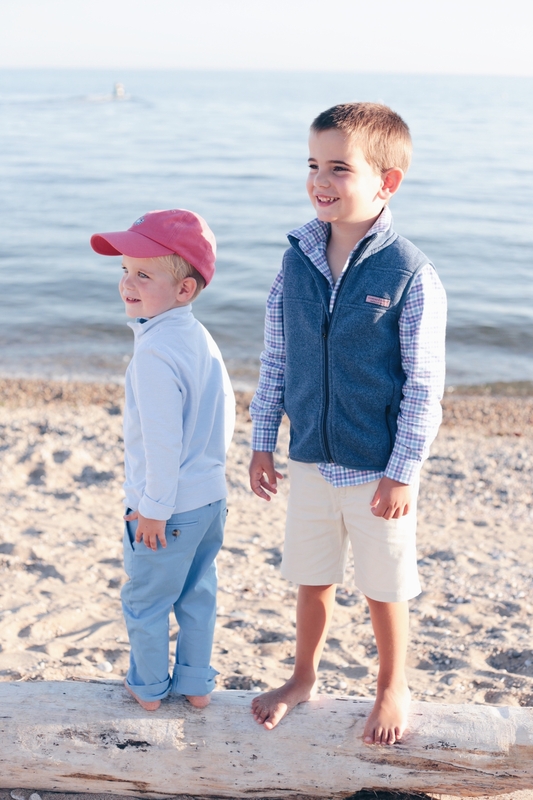 Make sure to check out vineyard vines for coastal chic fashion goodness and use code FRIENDS2018 for 25% off your purchase during the Friends and Family Sale. Thanks so much for stopping by!! And thank you to vineyard vines and ShopStyle for sponsoring this post. Loved the pics of your beautiful family and the cute clothes. and how exciting at the idea of making the cottage a year round home! Rachel – been following you for a while and love your style – it’s perfect for us New England moms! My fam and I live in MA, but bought a summer cottage in Little Compton RI a year ago. (It was built in 1840!). We’ve talked about making our full-time home, since we can work form home and drive to see clients. But for us it came down to 2 things – 1) schools (not great in that area) and 2) what a summer cottage really means to us – a place to escape the ho-hum of our day-to-day lives. If we were to make LC our full-time house, we think it would lose the appeal of being a place we look forward to escaping to, where we disconnect and unwind. You make great points! There are good school systems where we bought but it is nice to escape!!! I appreciate your input so much!!! Oh nice Rachel! Love your family photos on the beach in Vineyard Vines!! What a fun idea to move to the beach full time! My hubby works from home and travels, so we have also thought about buying a beach home in Maine and spend our entire summers there! I say make it a year round home gradually and enjoy a few summers there to see if full time beach living is your thang! But wait…you are finally getting your house back together now and actually have a working bathroom!! LOL!! Maybe escaping to the summer home is desirable now since your current home in in disarray from the huge home reno. Remember all the things that made you want your current home….walking distance to all the places that you like to go. Close to your parents…whole foods… There are many bloggers that live on the shore. Perhaps reach out to them. I often hear them talk about how far they are from stores, etc. Good luck with your decision. You are quite fortunate to have the best of both worlds.